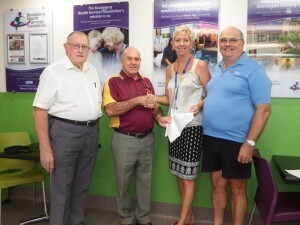 A wonderful donation of $4522 received to buy a specialised recliner chair for Bundaberg Hospital. This was provided by the Gin Gin Bendigo Community Bank ($3522) and the Corinthian Chapter of Freemasons QLD. These specialist chairs are very good for patients especially during unexpected events like a cardiac arrest or seizures as they can lie flat for resuscitation. This allows prompt management rather than waiting for wards men to come and lift them back to bed, while someone is trying to prevent them from falling. Patients are also encouraged to mobilise out of bed into chairs to reduce their risk of blood clots and chest infections. This entry was posted on Monday, April 14th, 2014 at 1:32 am	and is filed under Media Releases. You can follow any responses to this entry through the RSS 2.0 feed. Both comments and pings are currently closed.